Let Fr. Mike Schmitz from Ascension Presents share the answers to the question, “Why Be Catholic and Not Just Christian?” in this video! https://assumptionbvm.com/wp-content/uploads/2018/04/why_be_Catholic_BFI-1.jpg 360 600 ABVM Communications https://assumptionbvm.com/wp-content/uploads/2015/05/img_logo_03.png ABVM Communications2018-04-27 08:00:132018-05-19 13:57:58Why Be Catholic? Here are Four Ways to Implement Our Lady’s Peace Plan from Heaven! Next installment – Step 2 0f 4 coming soon! When reading the lives of the saints, it can sometimes be discouraging. Why? Because we’re not able to find anyone who is even remotely like us. It can seem as though only old priests, nuns and monks can be saints. Its almost as if you have to be a gray-haired religious to be holy. However, this is nowhere near the truth. Pope Francis clearly points this out in his exhortation, Gaudete et Exsultate. To be holy does not require being a bishop, a priest or a religious. We are frequently tempted to think that holiness is only for those who can withdraw from ordinary affairs to spend much time in prayer. That is not the case. We are all called to be holy by living our lives with love and by bearing witness in everything we do, wherever we find ourselves. Young people especially are capable of becoming saints, though we often think that is impossible. Their zeal and energy, if pointed in the right direction, can change the world. Here is a short list of three teenagers who prove that holiness is possible for everyone, and how God uses their gifts and talents for his greater glory. Acutis loved computers and used them to spread the faith. One of his most significant computer ventures was cataloguing all the Eucharistic miracles of the world. He said, “The more Eucharist we receive, the more we will become like Jesus, so that on this earth we will have a foretaste of Heaven.” He died of leukemia at age 15. Zelíková was a simple teenager who loved Jesus dearly. She wrote, “true beauty is hidden in faithfulness in little things. I always desired to do great and heroic deeds of love, but when I saw that I was unable, I was grieved by it. Now I find great heroism precisely in little things, so that now I haven’t the slightest regret whether I can do something or not.” She died of tuberculosis at age 17. This weekend, you are invited to Take a Closer Look. After each Mass, representatives of the Care for the House of the Lord steering committee will offer guided tours so that you can view the areas included in the project and learn what the professionals have recommended. Most families have recently completed filing their 2017 income tax returns. This is the perfect time to review the level of charitable contributions you have made, compared to your income. Each of us has been blessed with unique talents and financial gifts. One expression of an ultimate financial goal is to contribute 10% of our income from our first fruits, to the needs of others to justly share our resources with the church and those who need our help. Five percent is a goal for support of the parish, one percent for CSA and four percent to other charitable causes. Did you know? Median Catholic household income in the U.S. is about the same as median Protestant household. If U.S. Catholic households simply gave at the same rate as their Protestant friends (not necessarily tithing, but 2.2 to 2.5% of their income) each U.S. Catholic parish would see its annual collection revenues double. Please prayerfully consider what your response will be to this year’s CSA/Care for the House of the Lord appeal. Gifts of all “shapes and sizes” will be needed. Be as generous as you can! The gift range chart below, illustrates the types of gifts necessary to achieve the financial goal. The timing and scope of the project will be determined after all commitments have been received. The project will be debt free. Let’s gather as a community of faithful and complete the whole project as soon as possible! By penance, our Lady explains that men must amend their lives. How? Give up their easy lives of sin, ask pardon for their sins and make reparation to the Sacred Heart of Jesus and the Immaculate Heart of Mary. Why? Because both are so grievously offended by the sins of men. By reparation, Our Lady means 4 steps. 1) Offering sacrifice to atone for our sins. 2) Fulfilling our daily duties to the best of our abilities. 3) Accepting the responsibilities of our state in life. 4) Obeying the Commandments of God. O my Jesus, I offer this for love of Thee, for the conversion of poor sinners, and in reparation for all the sins committed against the Immaculate Heart of Mary. in just punishment for its many crimes. The Rosary is like a sword or weapon the Mother of God can use to cut down heresy and the forces of evil. It is most powerful. And many times it has saved the world from situations as bad as, if not worse than, the ones facing us today. In addition, the Blessed Mother encourages and recommends The Family Rosary. “The family that prays together stays together”. Threats continually bombard families with breakup on all sides. This devotion consists of 4 parts. 1) Going to Confession. 2) Receiving Holy Communion. 3) Reciting 5 decades of the Rosary. 4) Spending 15 minutes with Our Lady meditating on the mysteries of the Rosary. Complete all with the intention of making reparation to her. Why? Because the Mediatrix of All Graces promises, at the hour of death, all graces necessary for salvation to those who faithfully practice this devotion for the First Saturday of any five consecutive months. (NOTE: The Confession may be made under the usual condition of 8 days before or after Holy Communion, provided the person is not in the state of mortal sin when he receives Holy Communion.) Due to the graces we receive, it seems like all people will make this devotion an especially relevant part of their lives! This consecration is the least understood but one of the most important parts of the message of Fatima. Our Lady is looking for people willing to become cells of prayer and sacrifice through consecration to her. 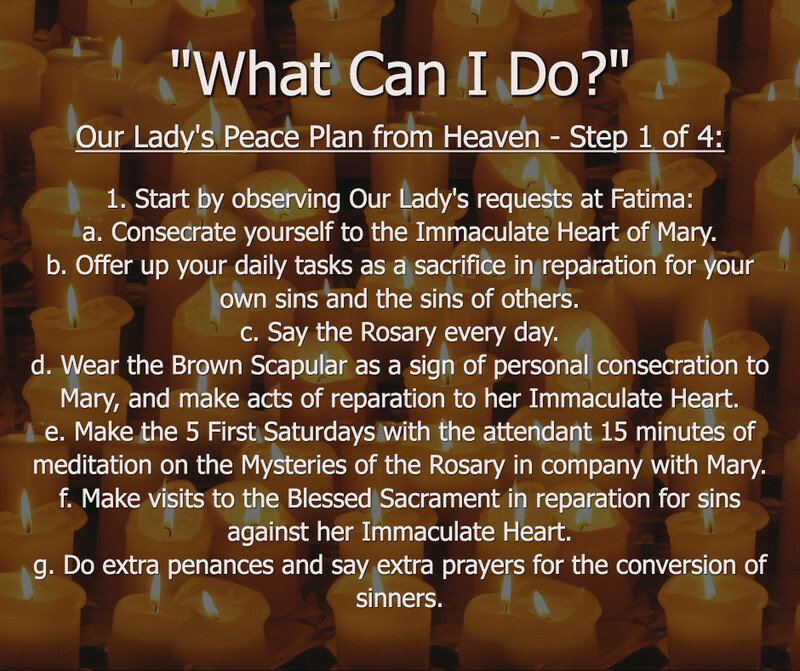 Personal consecration to the Immaculate Heart of Mary can take many forms. It can be done simply by reciting with sincerity the Act of Consecration. This consecration can be renewed each day merely by saying the morning offering to the Sacred Heart of Jesus. However, the act itself should be repeated on all important feast days of the Blessed Mother. More important than reciting the act is to live up to the conditions which it sets forth. Most noteworthy by fulfilling Our Lady’s requests at Fatima. In consecrating oneself to Mary, a Christian fulfills four goals. Christians pay her homage. You place yourself in her service. One places himself under her protection. And you strive to imitate her virtues. For the average layman, it’s best to wear the Brown Scapular of Our Lady of Mount Carmel. Therefore, Sister Lucia states that all Catholics need to hear the call to wear the Brown Scapular as part of the Fatima message. She says, “The Rosary and the Scapular are inseparable.” A person who wears this Scapular declares that he or she belongs to Mary. In return, the Mother of God promises eternal life to those who die wearing this mantle. In 1251, when she gave the Scapular to St. Simon Stock and thereby to the world, the Queen of Heaven stated, “Whoever dies clothed in this shall never suffer eternal fire.” Consequently, wearing the Scapular serves as a constant reminder of one’s personal consecration to Mary and of the necessity of imitating her virtues and heeding her requests. At Fatima, Our Lady’s promises reveal that, in the end, her Immaculate Heart will triumph, Russia will be converted and God will grant some time of peace to the world. That final triumph can come soon if enough people will still grant Her requests from Fatima. It depends upon how many of us are willing to follow Our Lady’s “peace plan from Heaven.” Are you willing? The Group Rosary Brings Forth Numerous Graces! This verse is often quoted to show the power of group prayer. This certainly includes praying in a group Rosary but is not exclusive to the Rosary. Furthermore, many popes have encouraged group Rosaries. Clearly these Pontiffs were encouraging, no beseeching, people to pray the Rosary together in groups. The Rosary is not only efficacious for personal spiritual growth and special graces. The Rosary is also powerful enough to end war and even save the world! All ages (from infant to adult) are encouraged to join as it’s never too early and it’s never too late to start praying the Rosary! If you’ve forgotten how to pray the Rosary, the Group Rosary recitations are the best way to re-learn. Fall in love with the Rosary all over again. Please join us. Rebuilding the floor under the altar area, which has lost some of its integrity. Removing wallpaper on the east and west walls (adjacent to the rose windows) and repairing two structural cracks. Repainting the center of the church ceiling, east and west walls, chapel, sacristy, narthex, cry room, usher/scrip room, and restrooms. Addressing the main entrance doors and exterior metal lintels (above doors/windows) which show signs of early rust. Refinishing of the pew cap rails, backs and ends. Reupholster pews, kneelers (qty. 61) and freestanding chairs/kneelers (qty. 80). Removal and disposal of old carpeting. De-installation of pews, while replacing the carpeting, maintaining integrity of the original floor bolt system. Installation of an inductive hearing assistance system (Hearing Loop System). Installation of new carpeting in the church, chapel, sacristy, cry room, and usher/scrip room. Additional items may be considered as parishioner input is gathered. The total estimated cost of the project is $233,000, including a 15% contingency. The Care for the House of the Lord project will be combined with the So Faith May Flourish 2018 CSA Campaign. Essentially, all contributions to the combined effort will be processed as CSA gifts and once our parish CSA goal is achieved, all additional funds will be returned to Assumption to support our parish project. In other words, to secure the future of our church building, you will be asked to include the Care for the House of the Lord project in addition to your annual CSA gift. Thank you for help in the worthy effort to maintain our home here at Assumption. It is amazing to realize how much grace and heavenly help we can receive by an act so simple as praying the Rosary regularly. It only takes 15 minutes to pray! Set aside time alone, with your family or with some friends to start the habit of reciting a daily Rosary. If you don’t think you have time, try praying on the way to work in the morning. You will surely notice the grace it brings to your life, as promised by Our Lady!